Objective Colorectal cancer (CRC) is a major health concern. Vitamin D deficiency is associated with high CRC incidence and mortality, suggesting a protective effect of vitamin D against this disease. Given the strong influence of tumour stroma on cancer progression, we investigated the potential effects of the active vitamin D metabolite 1α,25-dihydroxyvitamin D3 (1,25(OH)2D3) on CRC stroma. Design Expression of vitamin D receptor (VDR) and two 1,25(OH)2D3 target genes was analysed in 658 patients with CRC with prolonged clinical follow-up. 1,25(OH)2D3 effects on primary cultures of patient-derived colon normal fibroblasts (NFs) and cancer-associated fibroblasts (CAFs) were studied using collagen gel contraction and migration assays and global gene expression analyses. Publicly available data sets (n=877) were used to correlate the 1,25(OH)2D3-associated gene signature in CAFs with CRC outcome. Results High VDR expression in tumour stromal fibroblasts was associated with better overall survival (OS) and progression-free survival in CRC, independently of its expression in carcinoma cells. 1,25(OH)2D3 inhibited the protumoural activation of NFs and CAFs and imposed in CAFs a 1,25(OH)2D3-associated gene signature that correlated with longer OS and disease-free survival in CRC. Furthermore, expression of two genes from the signature, CD82 and S100A4, correlated with stromal VDR expression and clinical outcome in our cohort of patients with CRC. Conclusions 1,25(OH)2D3 has protective effects against CRC through the regulation of stromal fibroblasts. Accordingly, expression of VDR and 1,25(OH)2D3-associated gene signature in stromal fibroblasts predicts a favourable clinical outcome in CRC. Therefore, treatment of patients with CRC with VDR agonists could be explored even in the absence of VDR expression in carcinoma cells. Several studies indicate a strong epidemiological association between vitamin D nutritional status and colorectal cancer (CRC). The most active vitamin D metabolite 1α,25-dihydroxyvitamin D3 (1,25(OH)2D3) has antitumour effects on cultured colon carcinoma cells and in several animal models for CRC. Vitamin D receptor (VDR) is downregulated in carcinoma cells of a proportion of human colon tumours, limiting the applicability of 1,25(OH)2D3 for CRC treatment. Tumour stromal fibroblasts are recognised to contribute to CRC progression. Accordingly, poor prognosis CRC subtypes are characterised by a pronounced desmoplastic stromal reaction and high expression of stromal fibroblast-associated gene signature. High VDR expression in tumour stromal fibroblasts is associated with longer survival in a large cohort of patients with CRC with prolonged clinical follow-up. Patient-derived colon normal fibroblasts (NFs) and cancer-associated fibroblasts (CAFs) express VDR and respond to 1,25(OH)2D3. 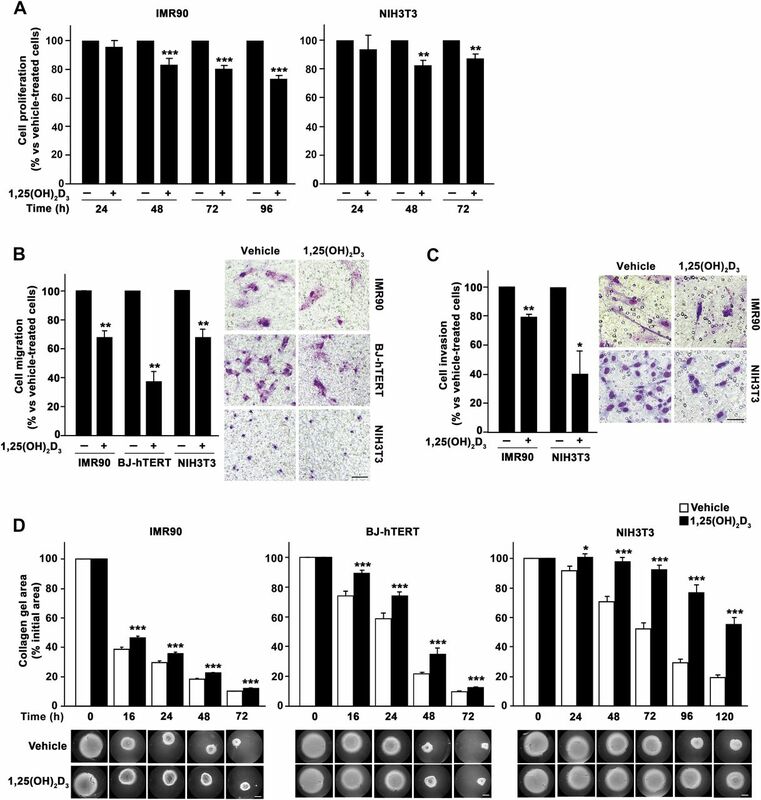 1,25(OH)2D3 inhibits two major NF and CAF protumoural properties: collagen gel contraction (a hallmark of fibroblast activation) and promigratory action on colon carcinoma cells. 1,25(OH)2D3 modulates the gene expression programme in NFs and CAFs and imposes in CAFs a gene signature that predicts a favourable clinical outcome in patients with CRC. 1,25(OH)2D3 has antitumour effects in CRC by acting on tumour stromal fibroblasts and, thus, the therapeutic action of VDR agonists may extend to patients with CRC who express VDR in tumour stromal fibroblasts even in the absence of VDR expression in carcinoma cells. VDR agonists could be explored as a therapy against tumour-activated stroma. Tumour stroma has a strong influence on cancer progression. Fibroblasts are the main cellular component of tumour stroma. Upon activation by the tumour microenvironment, they contribute to tumourigenesis by several mechanisms: secretion of molecules that act paracrinally on carcinoma and immune cells, modulation of extracellular matrix organisation and recruitment of bone marrow precursors.11–15 Accordingly, stromal fibroblasts increase the frequency of tumour-initiating cells and contribute to poor prognosis in CRC.16 ,17 Despite this and the beneficial action of vitamin D against this neoplasia, the potential effects of 1,25(OH)2D3 on the stroma of patients with CRC are unknown. 1,25(OH)2D3 action is mediated by the vitamin D receptor (VDR), a member of the superfamily of nuclear receptors that upon ligand activation regulates the transcription rate of hundreds of human genes. Thus, VDR expression is the main determinant of cell responsiveness to 1,25(OH)2D3.3 ,5 In this study, we explored VDR expression and 1,25(OH)2D3 action on CRC stroma. We report that high VDR expression in tumour stromal fibroblasts is associated with a better clinical outcome in CRC. In addition, 1,25(OH)2D3 inhibits the protumoural properties of patient-derived primary colon normal fibroblasts (NFs) and cancer-associated fibroblasts (CAFs) and imposes in CAFs a gene signature that correlates with longer survival of patients with CRC. Thus, we show that CRC stromal fibroblasts express VDR and evidence that the modulation of their gene expression and physiology by 1,25(OH)2D3 contributes to the antitumoural action of 1,25(OH)2D3 on this disease. Details for cells and cell culture, cell immunofluorescence, RNA isolation and reverse transcription (RT)-qPCR, western blot, cell proliferation and detection of microsatellite instability (MSI) phenotype and B-RAF V600 mutations in colorectal tumours are included in online supplementary methods. To establish primary cultures of human colon normal and tumour fibroblasts, tissue samples from colon primary tumour and morphologically normal colonic mucosa (at least 5 cm from the surgical margin) of the same patient were obtained from fresh surgical specimens resected from 32 patients with CRC subjected to surgery at Hospital Universitario La Paz (Madrid, Spain) between 2013 and 2015. Samples were provided by the IdiPAZ Biobank (RD09/0076/00073) integrated in the Spanish Biobank Network (http://www.redbiobancos.es). Clinicopathological data were collected from clinical records and included age, gender, tumour localisation, tumour differentiation and the presence of lymph node or distant metastases. All patients gave written informed consent. For immunohistochemical analysis, tissue sections from human primary tumours from patients with metastatic CRC (n=658) with clinical follow-up (median 18.7 months) were retrieved from Fundación Jiménez Díaz Biobank (PT13/0010/0012; Madrid, Spain) integrated in the Spanish Biobank Network (http://www.redbiobancos.es). Tumour specimens were retrospectively selected from consecutive patients with metastatic CRC (1998–2009), which had fulfilled the following criteria: adenocarcinoma, metastatic disease, no neoadjuvant therapy, available tissue and clinical follow-up. According to our institutional and European Society for Medical Oncology guidelines,18 follow-up exam was performed every 3–6 months and included physical examination, thoracic and abdominal CT scan and measurement of carcinoembryonic antigen serum levels. Complete clinicopathological data were collected from clinical records by medical oncologists. Data included age, gender, number and location of metastases, treatment administered, response to therapy and survival data. Overall survival (OS) was defined as the time elapsed from metastasis diagnosis to the date of death from any cause or the date of last follow-up. Progression-free survival (PFS) was calculated from the first day of systemic treatment for metastatic disease to the date when disease progression was detected or the date of death from any cause. Disease progression was defined as any change in the radiological aspect of a lesion that meets the Response Evaluation Criteria in Solid Tumors for progressive disease,19 the appearance of a new malignant lesion originating from the same tumour or the development of a new cancer in the same or in a different organ. All patients gave written informed consent. Primary fibroblast cultures were obtained following the explant outgrowth technique20 from fresh surgical specimens resected from patients with CRC. Tissue samples from colon primary tumour and morphologically normal colonic mucosa of the same patient were incubated for 30 min with phosphate buffered saline (PBS) containing 0.5 mg/mL Primocin (InvivoGen, San Diego, California, USA), 0.1 mg/mL gentamicin and 0.5 µg/mL amphotericin-B (both from Life Technologies, Carlsbad, California, USA). Then, tissue samples were cut into small pieces of approximately 3 mm3 in size and seeded in cell culture flasks in fetal bovine serum (FBS) (Life Technologies) with 0.25 mg/mL Primocin. After 1 week and to facilitate fibroblast growth, FBS was replaced by fibroblast growth medium-2 (FGM-2, Lonza, Basel, Switzerland). Fibroblasts grew around the explants for approximately 3 weeks (figure 2A). Then, tissue fragments were removed and fibroblasts were routinely subcultured at an 1:2 ratio in FGM-2. All experiments were performed with primary fibroblasts at seventh passage at most. Collagen gels were prepared by mixing fibroblasts with PureCol bovine type I collagen (Advanced Biomatrix, San Diego, California, USA), 5x Dulbecco's modified Eagle's medium (DMEM), 0.1 M NaOH and distilled water (final concentrations: 1.7 mg/mL PureCol, 1x DMEM and 3 mM NaOH) in the presence of 100 nM 1,25(OH)2D3 or vehicle. The mixture was seeded in 24-well cell culture plates and allowed to polymerise. Then, culture medium with 100 nM 1,25(OH)2D3 or vehicle was added. After 24 h and to initiate gel contraction (time 0), gels were released from the 24-well plates and transferred into 6-well plates containing culture medium with 100 nM 1,25(OH)2D3 or vehicle. At the indicated times, images were taken with an E4500 digital camera (Nikon, Tokyo, Japan) mounted in a MZ6 modular stereomicroscope (Leica, Wetzlar, Germany), and gel area was measured with ImageJ (National Institutes of Health, Bethesda, Maryland, USA). Images were processed using Adobe Photoshop CS6 (San Jose, California, USA). Experiments were performed using triplicates. For fibroblast migration and invasion assays, equal numbers of fibroblasts pretreated for 48 h with 100 nM 1,25(OH)2D3 or vehicle were seeded on the upper compartment of 8 µm-pore Transwells (Corning Incorporated, Corning, New York, USA) in FBS-free culture medium. For invasion assays, the upper surface of the Transwells was precoated with 12.5 μg Matrigel Basement Membrane Matrix (BD Biosciences, San Jose, California, USA). FBS-containing culture medium was added to the lower compartment and both compartments were supplemented with 100 nM 1,25(OH)2D3 or vehicle to maintain previous treatment. After 4 h (NIH3T3 migration), 24 h (NIH3T3 invasion, IMR90 and BJ-hTERT migration) or 72 h (IMR90 invasion), cells on the upper surface of the Transwell were removed using a cotton swab and cells attached to the lower surface (migrating/invading cells) were stained with Diff-Quik reagent (Dade Behring, Deerfield, Illinois, USA). Images of stained cells (10 fields/Transwell) were captured with an Olympus DP70 digital camera (Center Valley, Pennsylvania, USA) mounted on an Axiophot microscope (Carl Zeiss, Oberkochen, Germany), and migrating/invading cells were counted. Images were processed using Adobe Photoshop CS6. Experiments were performed using triplicates. For fibroblast-induced SW480-ADH cell migration assays, fibroblasts were seeded in the lower compartment of 8 µm-pore Transwells and treated with 100 nM 1,25(OH)2D3 or vehicle for 48 h. Then, fibroblast monolayer was washed, culture medium was replaced and SW480-ADH cells were seeded in the upper compartment in FBS-free culture medium. After 24 h, the number of migrating SW480-ADH cells was estimated as described above. Experiments were performed using triplicates and Transwells without fibroblasts were used as a control. RNA from seven paired NF and CAF primary cultures treated with 100 nM 1,25(OH)2D3 or vehicle for 48 h was extracted as described in online supplementary methods. RNA samples were labelled using the One-Color Microarray-Based Gene Expression Analysis (Low Input Quick Amp Labelling) Kit and hybridised to Human Gene Expression G3 60K V.2 Microarrays (design ID 039494) (both from Agilent Technologies, Santa Clara, California, USA). Images were analysed and quantitated by Agilent Feature Extraction Software V.11.5, which performed feature quantitation and additive detrend correction. Raw data were submitted to the Gene Expression Omnibus (GEO) database (http://www.ncbi.nlm.nih.gov/gds/) under the accession number GSE70468. Microarray background subtraction was carried out using normexp method. To normalise the data set, we performed loess normalisation within microarrays and quantiles normalisation between microarrays. Differentially expressed genes were obtained by applying linear models and moderated paired t test using Bioconductor's limma package (http://www.bioconductor.org).21 To account for multiple hypotheses testing, the estimated significance level (p Value) was adjusted using Benjamini & Hochberg false discovery rate (FDR) correction. Those genes with FDR<0.05 were selected as differentially expressed between 1,25(OH)2D3-treated and vehicle-treated NFs or CAFs. Gene ontology (GO) functional enrichment analysis of the differentially expressed genes was performed using the Database for Annotation, Visualization and Integrated Discovery V.6.7 (http://david.abcc.ncifcrf.gov/). Significantly enriched (FDR<0.05) GO terms were selected. We established a 1,25(OH)2D3-associated gene signature with the genes most differentially regulated by 1,25(OH)2D3 in CAFs (FDR<0.05, −1>log2 fold-change>1, 66 genes) and used SignS (http://signs2.iib.uam.es/)22 applying the threshold gradient descent method for the Cox model23 to build a predictive model for the risk based on the impact of the 1,25(OH)2D3-associated gene signature on the disease-free survival (DFS) or OS of three external publicly available GEO data sets (GSE33113, GSE14333 and GSE39582) that contain microarray gene expression and disease progression data from 89 American Joint Committee on Cancer (AJCC) stage II, 226 AJCC stage I–II–III and 562 AJCC stage I–II–III–IV patients with CRC, respectively. Microarray data of the external data sets were normalised as described above, and 18 genes had to be removed from the 1,25(OH)2D3-associated gene signature as they were not included in the gene expression data of the external data sets, resulting in a 1,25(OH)2D3-associated gene signature of 48 genes (see online supplementary table S11 for the list of genes that comprise the signature). Kaplan–Meier survival curves were generated to plot the DFS or OS of patients having a high correlation versus low correlation with the signature. Formalin-fixed paraffin-embedded 3 μm colorectal tumour tissue sections were stained using antibodies against VDR, CD82 (12550 and 12439, Cell Signaling Technology, Danvers, Massachusetts, USA), S100A4, cytokeratin-20, vimentin, a-smooth muscle actin (α|-SMA) and CD45 (A5114, GA777, GA630, M0851 and GA751, Dako, Glostrup, Denmark) following the procedure detailed in online supplementary methods. Cytokeratin-20 (epithelial cells), α-SMA and vimentin (fibroblasts) and CD45 (lymphoid cells) were used as cell type-specific markers. To evaluate the specificity of VDR staining, tissue sections of small intestines from wild type and Vdr knock-out mice24 ,25 and a set of 10 human colorectal tumours were incubated with anti-VDR antibody, rabbit IgG isotype control antibody (3900, Cell Signaling Technology) or without primary antibody. Complete absence of staining was observed in Vdr knock-out tissues and in the negative control conditions. To establish high versus low VDR, S100A4 and CD82 expression levels, receiver operating characteristic analysis was used to determine the optimal cut-off point for each protein based on clinical endpoint (specific death due to CRC vs censored: lost to follow-up, alive or death from other causes), as previously described.26 ,27 In this procedure, the continuous values of VDR, S100A4 or CD82 expression were tested for their sensitivity and specificity at different cut-off points, and the point that maximised the sum of sensitivity and specificity was determined. Specimens with values above or below that point were considered as tumours with high or low expression, respectively. Kaplan–Meier survival analysis with log-rank test was used to plot survival curves and estimate differences between patients with high or low VDR, S100A4 or CD82 expression. The prognostic effect of VDR expression and other clinicopathological variables was first assessed by univariate Cox regression analysis using as clinical endpoint OS or PFS from metastatic event. Then, multivariate Cox regression analysis adjusting for the previously identified prognostic factors was performed to show those factors with independent prognostic effect on OS or PFS. Associations between VDR expression levels and clinicopathological characteristics of the patients were analysed with χ2 test (Fisher's exact test). 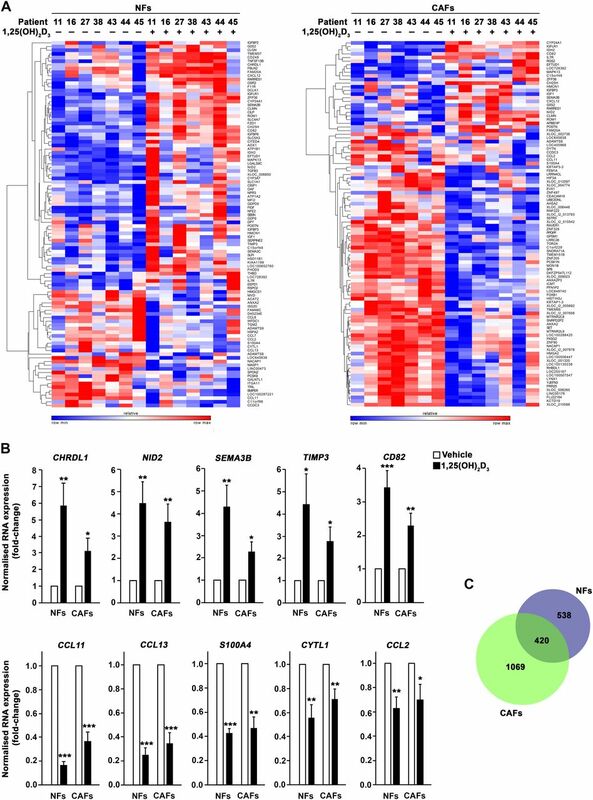 Correlations between VDR expression levels and CD82 or S100A4 expression in tumour stromal fibroblasts were assessed by Mann–Whitney U test. Statistical analyses were conducted using SPSS V.13.0 (Chicago, Illinois, USA). All reported p values are two-sided. For experiments with primary cultures and cell lines, the results are expressed as mean±SEM and the statistical significance was assessed by two-tailed unpaired Student's t test using GraphPad Instat3 (La Jolla, California, USA) unless otherwise specified. Differences were considered significant when p<0.05. * indicates p<0.05, **p<0.01 and ***p<0.001. The correlations between VDR and CYP24A1 RNA expression in primary cultures, and between VDR RNA expression and primary fibroblast promigratory action on SW480-ADH cells were assessed by Pearson correlation coefficient using SPSS V.13.0. Statistical analyses of microarray data and immunohistochemistry results were explained in the corresponding sections. 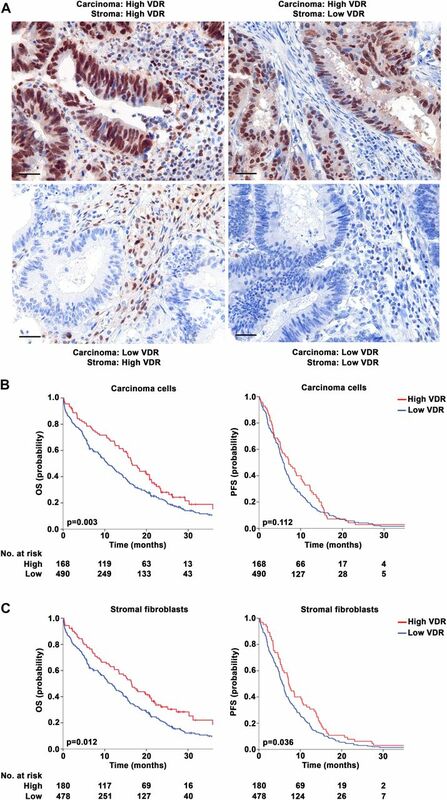 We used immunohistochemistry to analyse VDR expression in 658 tumour tissues from a cohort of patients with metastatic CRC with prolonged clinical follow-up (see online supplementary table S1 for patient clinicopathological characteristics). The specificity of the anti-VDR antibody used was analysed as previously described28 ,29 (see online supplementary figure S1). Intense nuclear and faint cytoplasmic VDR expression was detected in carcinoma and stromal cells of human CRC (figure 1A). We found that VDR expression in carcinoma and stroma of primary tumours differed widely among patients: 14.3% of tumours showed high VDR levels in both compartments, 11.2% displayed high VDR in carcinoma cells and low in stroma, 13.1% presented high VDR in stroma and low in carcinoma and 61.4% had low VDR in both compartments (figure 1A). Double immunofluorescence analyses of VDR and several cell type-specific markers were performed to characterise the precise cell types that express VDR. We found that VDR was expressed in carcinoma cells (cytokeratin-20 positive), in tumour stromal fibroblasts (α-SMA and vimentin positive) and in tumour stromal lymphocytes (CD45 positive) (see online supplementary figure S2). Vitamin D receptor (VDR) expression in stromal fibroblasts of colorectal tumours predicts clinical outcome. (A) Representative immunohistochemical images of VDR protein expression in carcinoma and stromal compartments of colorectal tumours. Bars, 20 μm. (B and C) Kaplan–Meier survival curves depicting overall survival (OS) or progression-free survival (PFS) of patients with colorectal cancer (CRC) (n=658) stratified by VDR protein expression levels in carcinoma cells (B) or in tumour stromal fibroblasts (C). Next, we analysed whether the expression of VDR in either tumour compartment was associated with patient outcome. We found that high VDR protein expression in carcinoma cells was associated with increased OS (median survival 17.4 months vs 12.6 months, p=0.003) but not PFS (median survival 10.1 months vs 7.5 months, p=0.112) (figure 1B). Strikingly, high VDR expression in tumour stromal fibroblasts was significantly associated with increased OS (median survival 17.2 vs 10.6 months, p=0.012) and PFS (median survival 11.5 months vs 6.9 months, p=0.036) (figure 1C). However, associations between VDR expression in tumour stromal lymphocytes and CRC patient survival were not observed (see online supplementary figure S3A). Multivariate Cox regression analysis confirmed that VDR expression in tumour stromal fibroblasts was an independent predictor for OS (HR=0.71, 95% CI 0.46 to 1.14, p=0.043; see online supplementary table S2) and revealed a trend towards significance for PFS (HR=0.83, 95% CI 0.61 to 1.14, p=0.067; see online supplementary table S3). In addition, high VDR expression in both compartments (carcinoma cells and tumour stromal fibroblasts) was significantly associated with longer OS (see online supplementary figure S3B). B-RAF mutation and MSI phenotype are negative and positive CRC prognostic factors, respectively.30 ,31 Interestingly, the significant association between VDR expression in tumour stromal fibroblasts and CRC survival seems to be general, as it was maintained in B-RAF wild type, non-MSI phenotype and MSI phenotype CRC subgroups, while a trend towards significance was observed in B-RAF mutated patients (see online supplementary figure S3C, D). The association of high VDR expression in tumour stromal fibroblasts with longer CRC patient survival led us to examine 1,25(OH)2D3 action on this cell type. To this end, we established primary cultures of human NFs and CAFs from fresh tumour tissue and paired normal colon mucosa from a new CRC patient cohort (n=32) using the explant outgrowth technique20 (figure 2A). Patient clinicopathological characteristics are detailed in online supplementary table S4. The expression of fibroblast markers (vimentin, α-SMA) and the absence of expression of epithelial proteins (cytokeratin-18, E-cadherin) confirmed the purity of the cultures (figure 2B). We found that all primary cultures expressed VDR RNA, with fourfold and ninefold differences between the lowest and the highest VDR levels in NFs and CAFs, respectively (figure 3A). See online supplementary table S5 for the comparison of VDR RNA expression in the primary cultures with that of high or low VDR-expressing tissues and several 1,25(OH)2D3-responsive cell lines.29 ,32–35 In addition, 1,25(OH)2D3 treatment significantly induced VDR RNA expression (figure 3B). Accordingly, we observed that NF and CAF primary cultures responded to 1,25(OH)2D3, as assessed by the induction of the 1,25(OH)2D3 target gene CYP24A1 (figure 3C). The magnitude of CYP24A1 induction ranges from threefold to 161 857-fold (median induction, 124-fold). Reinforcing the importance of VDR expression for 1,25(OH)2D3 action, a direct correlation existed between VDR RNA expression in untreated fibroblasts and the CYP24A1 RNA levels achieved after 1,25(OH)2D3 treatment (figure 3D). Establishment of human colon normal fibroblast (NF) and cancer-associated fibroblast (CAF) primary cultures. (A) Representative phase-contrast images showing the outgrowth of fibroblasts from fresh colon biopsies obtained by surgery. Bar, 100 μm. (B) Representative phase-contrast and immunofluorescence images showing NF and CAF phenotypes and expression of fibroblast (vimentin and α-SMA) or epithelial (cytokeratin-18 and E-cadherin) markers. HT29 human colon carcinoma cells have an epithelial origin and were used as a control. Bars, 60 μm. Patient-derived colon normal fibroblast (NF) and cancer-associated fibroblast (CAF) primary cultures express vitamin D receptor (VDR) and respond to 1α,25-dihydroxyvitamin D3 (1,25(OH)2D3). (A) VDR RNA expression measured by RT-qPCR in 32 paired human colon NF and CAF primary cultures and calculated in relation to that of CCD18Co human normal colon fibroblasts. Horizontal bars indicate the median values. (B) RT-qPCR analysis of VDR expression in the same primary cultures as in (A) treated for 48 h with 100 nM 1,25(OH)2D3 or vehicle. Mean±SEM of the fold-change after 1,25(OH)2D3 treatment is depicted. (C) CYP24A1 RNA expression measured by RT-qPCR in the same primary cultures as in (A) treated for 48 h with 100 nM 1,25(OH)2D3 or vehicle. Data are shown as log10 and horizontal bars indicate the median values. (D) Correlation between VDR RNA expression in vehicle-treated and CYP24A1 RNA expression in 1,25(OH)2D3-treated (48 h) human colon NFs and CAFs (n=64). Data are shown as log10. Next, we studied the effects of 1,25(OH)2D3 on two fibroblast properties that are linked to a protumoural phenotype. First, the ability to reorganise collagen fibres and contract collagen gels was evaluated in 10 randomly selected paired NF and CAF primary cultures as a marker of fibroblast activation. Although the potency of the effect varied among patients, we found that 1,25(OH)2D3 significantly decreased the capacity of both NFs and CAFs to contract collagen gels (figure 4A, B). The inhibitory effect of 1,25(OH)2D3 on collagen gel contraction assays was significantly higher in NFs than in CAFs (figure 4B). 1,25(OH)2D3 also reduced the ability of NFs and CAFs to paracrinally promote the migration of SW480-ADH human colon carcinoma cells in Transwell-mediated coculture assays (figure 4C, D). Remarkably, VDR RNA levels in untreated fibroblasts inversely correlated with the capacity of 1,25(OH)2D3-pretreated fibroblasts to induce SW480-ADH cell migration (figure 4E), suggesting that VDR expression levels determine the extent of the inhibitory effect of 1,25(OH)2D3 on fibroblast protumoural properties. 1α,25-Dihydroxyvitamin D3 (1,25(OH)2D3) represses the protumoural phenotype of colorectal cancer (CRC) patient-derived stromal fibroblasts. (A) Representative collagen gel contraction assay. Normal fibroblasts (NFs) from patient 11 were embedded in collagen gels in the presence of 100 nM 1,25(OH)2D3 or vehicle and gel area was measured at the indicated times. Representative stereomicroscope images of collagen gels are shown. Bar, 400 μm. The experiment was performed in triplicate and mean±SD is depicted. (B) Collagen gel contraction assay of 10 paired NF (N) and cancer-associated fibroblast (CAF) (C) primary cultures in the presence of 100 nM 1,25(OH)2D3 or vehicle. 1,25(OH)2D3 effect (fold-change vs vehicle) in the gel area after 72 h is depicted. The results from each patient (left) and the mean±SEM of all patients (right) are shown. (C) Representative SW480-ADH cell migration assay. Cell migration was assessed after 24 h of Transwell-mediated coculture of SW480-ADH human colon carcinoma cells with NFs from patient 27 pretreated with 100 nM 1,25(OH)2D3 or vehicle for 48 h. Representative images of migrating cells and a scheme of the experiment are shown. Bar, 100 μm. The experiment was performed in triplicate and mean±SD is depicted. Transwells without fibroblasts were used as a control. (D) Promigratory action exerted by 11 paired NF (N) and CAF (C) primary cultures pretreated with 100 nM 1,25(OH)2D3 or vehicle for 48 h on SW480-ADH cells. The effect of 1,25(OH)2D3 pretreatment (percentage of the promigratory action exerted by vehicle-pretreated fibroblasts) is shown. The results from each patient (left) and the mean±SEM of all patients (right) are depicted. 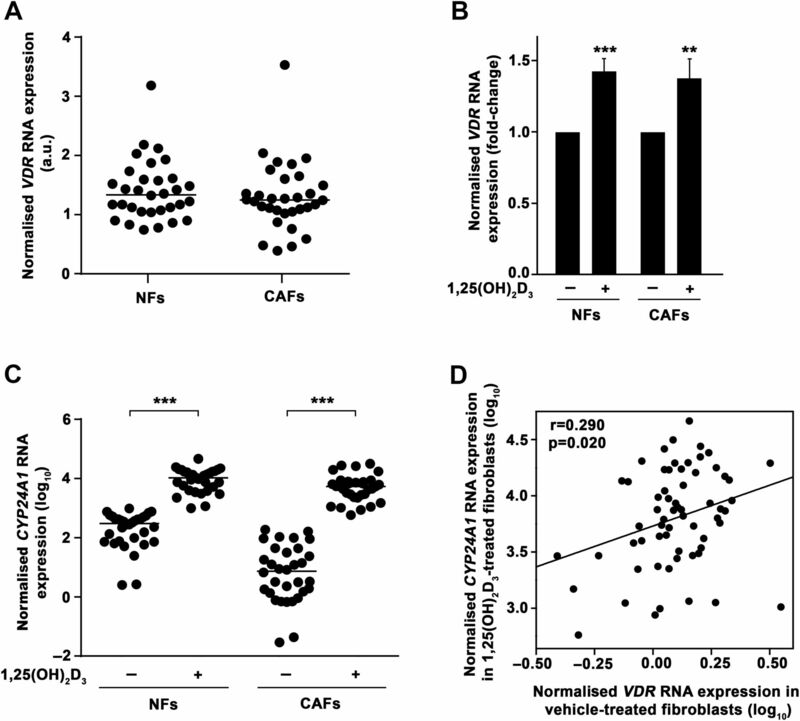 (E) Correlation between VDR RNA expression in vehicle-treated NF and CAF primary cultures and their promigratory action on SW480-ADH cells after 1,25(OH)2D3 pretreatment (n=22). Data are shown as log10. To further characterise 1,25(OH)2D3 effects on stromal fibroblasts, we performed global transcriptomic analyses of seven paired NF and CAF primary cultures treated with 1,25(OH)2D3 or vehicle for 2 days. We found 958 (47% induced and 53% repressed) and 1489 (35% induced and 65% repressed) genes differentially regulated (FDR<0.05) by 1,25(OH)2D3 in NFs and CAFs, respectively. The 100 genes most regulated (highest fold-change) by 1,25(OH)2D3 in each fibroblast type are shown in figure 5A and the complete lists of differentially regulated genes are provided in online supplementary tables S6 and S7. A selected subset of induced (CHRDL1, NID2, SEMA3B, TIMP3, CD82) and repressed (CCL11, CCL13, S100A4, CYTL1, CCL2) 1,25(OH)2D3 target genes were validated by RT-qPCR in an independent series of seven patients (figure 5B). We found that 21% of 1,25(OH)2D3 target genes were common to NFs and CAFs, while 26% and 53% were exclusively regulated by 1,25(OH)2D3 in NFs and CAFs, respectively (see figure 5C and online supplementary table S8). This suggested that 1,25(OH)2D3 modulates both common and specific gene expression programmes in colon NFs and CAFs. Further functional enrichment analysis (see online supplementary tables S9 and S10) implicated 1,25(OH)2D3 target genes in fibroblast properties such as cell adhesion and migration, extracellular matrix organisation, wound healing, blood vessel development and tissue remodelling. GO terms linked with chemokine activity, cell communication, inflammatory response and immune system were also enriched. Accordingly, the extracellular region was the cellular component GO term that recapitulates more target genes. 1α,25-Dihydroxyvitamin D3 (1,25(OH)2D3) regulates the gene expression profile of human colon normal fibroblasts (NFs) and cancer-associated fibroblasts (CAFs). (A) Heat maps showing microarray results for the 100 genes most differentially regulated (false discovery rate (FDR)<0.05 and the highest fold-changes) by 100 nM 1,25(OH)2D3 treatment (48 h) in seven paired NF and CAF primary cultures. See online supplementary tables S6 and S7 for the complete list of differentially regulated genes (FDR<0.05). (B) Validation by RT-qPCR of 10 1,25(OH)2D3 target genes identified in the microarray study in an independent series of seven paired NFs and CAFs (patients 9, 17, 20, 24, 25, 34 and 35) treated with 100 nM 1,25(OH)2D3 or vehicle for 48 h. Mean±SEM of the fold-change after 1,25(OH)2D3 treatment is depicted. (C) Venn diagram showing the overlap between 1,25(OH)2D3-regulated genes in NFs and CAFs. The number of genes included in each group is depicted and the complete list of genes can be found in online supplementary table S8. Next, we examined whether the gene expression programme promoted by 1,25(OH)2D3 in CAFs was associated with clinical behaviour in CRC. To this end, we defined a 1,25(OH)2D3-associated gene signature with those genes most differentially regulated by 1,25(OH)2D3 in CAFs (FDR<0.05, 0.5>fold-change>2, 48 genes; see online supplementary table S11) and analysed the predictive value of the signature in three unrelated publicly available GEO data sets (GSE33113, GSE14333, GSE39582), which contain microarray gene expression and DFS data from 89 AJCC stage II, 226 AJCC stage I–II–III and 497 AJCC stage I–II–III patients with CRC, respectively. We found that the expression of the 1,25(OH)2D3-associated gene signature correlated with better DFS in the three data sets (GSE33113, p=0.001; GSE14333, p=0.006; GSE39582, p<0.001) (figure 6A): patients with a high score for the 1,25(OH)2D3-associated gene signature displayed significantly longer survival than low score patients. Accordingly, a high score of the 1,25(OH)2D3-associated gene signature correlated with prolonged OS in GSE39582, which also contains gene expression and OS data from 562 AJCC stage I–II–III–IV patients with CRC (p<0.001) (figure 6B). Then, to validate these results in an independent patient cohort and at protein level, we selected from the signature CD82 (also known as KAI1), an induced gene with metastasis-suppressor activity,36 ,37 and S100A4, a repressed gene that is a marker of fibroblast activation,15 ,38 for immunohistochemical analysis in our cohort of 658 patients with CRC. We found that both proteins were exclusively expressed in tumour stroma and not in carcinoma cells: CD82 was detected diffusely in cytoplasm and membrane of stromal cells, while S100A4 was expressed in the nucleus and cytoplasm of stromal fibroblasts (figure 6C). 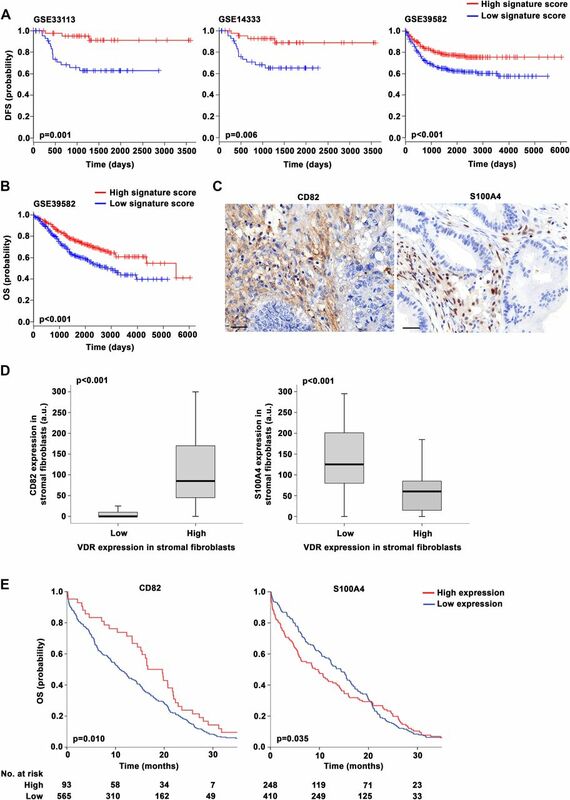 Confirming transcriptomic data, quantification of immunohistochemistry results showed that the expression of CD82 and S100A4 in the stromal fibroblast compartment of colon tumours significantly correlated directly and inversely, respectively, with that of VDR (figure 6D). Moreover, high CD82 expression and low S100A4 expression in tumour stromal fibroblasts were significantly associated with longer OS in CRC (median survival 21.4 months vs 11.2 months, p=0.010 for CD82; median survival 14.9 months vs 9.8 months, p=0.035 for S100A4) (figure 6E). 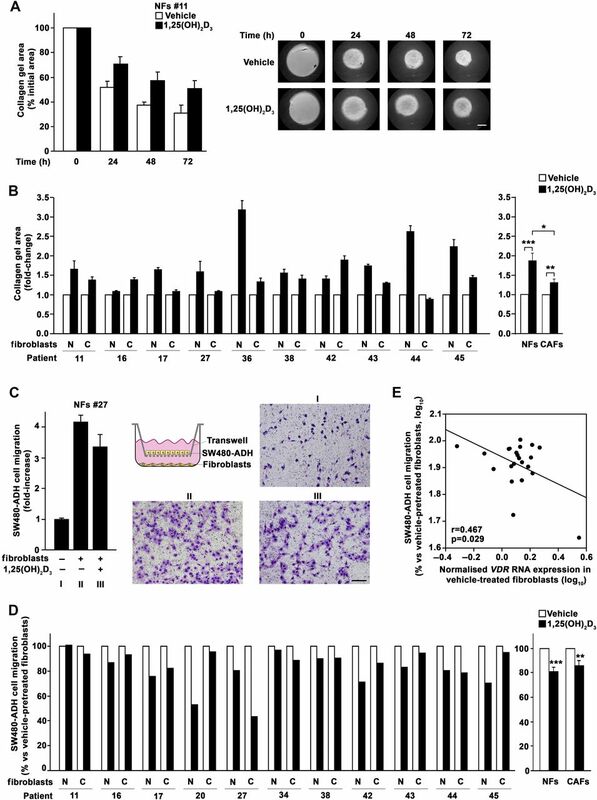 1α,25-Dihydroxyvitamin D3 (1,25(OH)2D3) imposes a gene signature in human colon cancer-associated fibroblasts (CAFs) that is associated with longer survival of patients with colorectal cancer (CRC). (A) Kaplan–Meier survival curves showing the impact of the 1,25(OH)2D3-associated gene signature on the disease-free survival (DFS) of patients with CRC from three unrelated publicly available external data sets (GSE33113, n=89, American Joint Committee on Cancer (AJCC) stage II; GSE14333, n=226, AJCC stage I–II–III; GSE39582, n=497, AJCC stage I–II–III). (B) Kaplan–Meier survival curves showing the impact of the 1,25(OH)2D3-associated gene signature on the overall survival (OS) of patients with CRC from GSE39582 data set (n=562, AJCC stage I–II–III–IV). (C) Representative immunohistochemical images of CD82 and S100A4 protein expression in human CRC samples. Bars, 20 μm. (D) Box plots showing CD82 or S100A4 protein expression in stromal fibroblasts located in colorectal tumours with low or high vitamin D receptor (VDR) protein expression levels in stromal fibroblasts (n=658). (E) Kaplan–Meier survival curves depicting OS of patients with CRC (n=658) stratified by CD82 or S100A4 protein expression levels in tumour stromal fibroblasts. Altogether, these results indicate that 1,25(OH)2D3 inhibits the protumoural properties of human colon stromal fibroblasts and changes their gene expression towards a programme that is associated with improved patient survival in CRC. To analyse the general validity of 1,25(OH)2D3 effects on fibroblasts, we extended our study to human IMR90 (lung) and BJ-hTERT (foreskin) and to mouse NIH3T3 (embryo) fibroblasts. All the analysed cell types expressed VDR and responded to 1,25(OH)2D3 in terms of gene regulation (CYP24A1 and OPN induction) (figure 7A–D). In addition, 1,25(OH)2D3 significantly decreased several fibroblast properties related with a protumoural phenotype. First, we found that 1,25(OH)2D3 decreased the proliferation of IMR90 and NIH3T3 fibroblasts (figure 8A). Second, 1,25(OH)2D3 reduced also the migratory capacity of IMR90, BJ-hTERT and NIH3T3 cells (figure 8B). Third, a similar inhibitory effect was observed on the invasiveness of IMR90 and NIH3T3 cells on Matrigel (figure 8C). Fourth, 1,25(OH)2D3 also decreased the ability of IMR90, BJ-hTERT and NIH3T3 cells to contract collagen gels (figure 8D). Moreover and in agreement with the data from colon NF and CAF primary cultures, 1,25(OH)2D3 inhibited the expression of the activated fibroblast marker S100A4 in IMR90, BJ-hTERT and NIH3T3 fibroblasts (figure 7E). 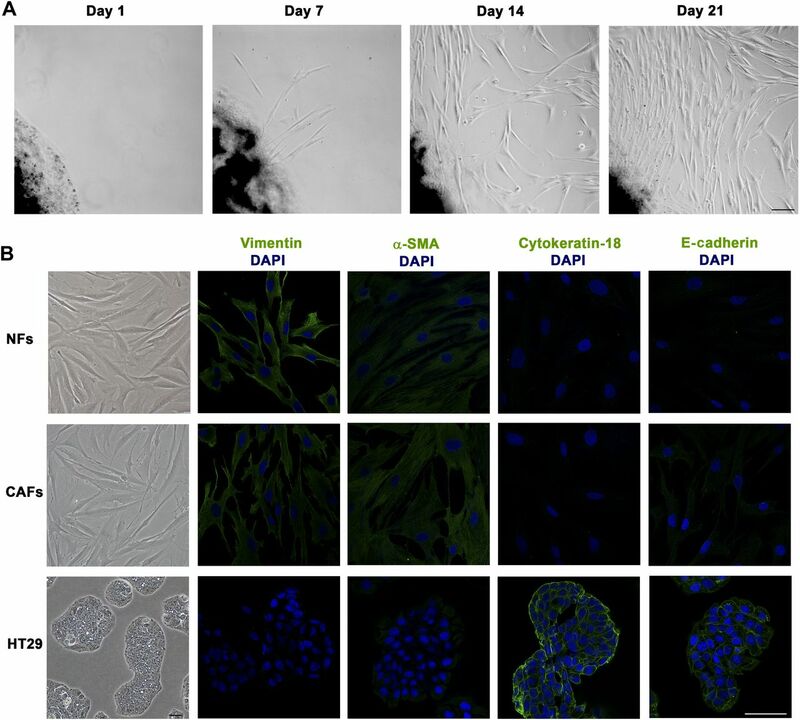 Human and mouse fibroblast cell lines express vitamin D receptor (VDR) and respond to 1α,25-dihydroxyvitamin D3 (1,25(OH)2D3). 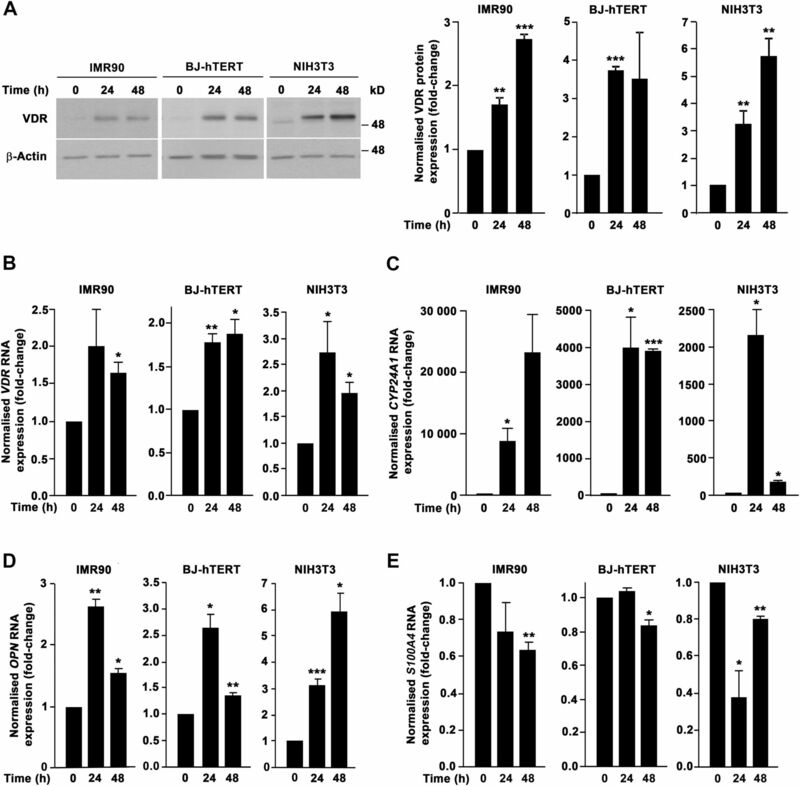 (A) Western blot analysis of VDR protein levels in IMR90, BJ-hTERT and NIH3T3 fibroblasts treated with 100 nM 1,25(OH)2D3 or vehicle for the indicated times. β-Actin was used as loading control. Images of a representative experiment and the quantification of three independent experiments (mean±SEM) are shown. (B–E) RT-qPCR analysis of VDR (B), CYP24A1 (C), OPN (D) and S100A4 (E) RNA levels in IMR90, BJ-hTERT and NIH3T3 fibroblasts treated with 100 nM 1,25(OH)2D3 or vehicle for the indicated times. Mean±SEM of three independent experiments is shown. 1α,25-Dihydroxyvitamin D3 (1,25(OH)2D3) inhibits the protumoural properties of several fibroblast cell lines of different origin. (A) Proliferation of IMR90 and NIH3T3 cells treated with 100 nM 1,25(OH)2D3 or vehicle for the indicated times was estimated by 3-(4,5-dimethylthiazol-2-yl)-2,5-diphenyltetrazolium bromide (MTT) assays. 1,25(OH)2D3 effect in cell proliferation is shown as a percentage versus vehicle-treated cells. Mean±SEM of three independent experiments is depicted. (B) Migratory capacity of IMR90, BJ-hTERT and NIH3T3 fibroblasts treated with 100 nM 1,25(OH)2D3 or vehicle. Representative images of migrating cells and the quantification (mean±SEM) of three independent experiments are shown. Bar, 100 μm. (C) Invasive capacity of IMR90 and NIH3T3 fibroblasts treated with 100 nM 1,25(OH)2D3 or vehicle. Representative images of invading cells and the quantification (mean±SEM) of three independent experiments are shown. Bar, 50 μm. (D) Collagen gel contraction assay. IMR90, BJ-hTERT and NIH3T3 fibroblasts were embedded in collagen gels in the presence of 100 nM 1,25(OH)2D3 or vehicle and gel area was measured at the indicated times. Representative stereomicroscope images of collagen gels and the quantification (mean±SEM) of three independent experiments are shown. Bar, 400 μm. Tumour microenvironment exerts a major influence on carcinoma behaviour. Stromal fibroblasts are the major cellular constituent of tumour stroma and contribute to CRC progression promoting angiogenesis and carcinoma invasion, increasing the frequency of tumour-initiating cells and inhibiting the immune response.16 ,39–41 Accordingly, poor prognosis CRC subtypes are characterised by a pronounced desmoplastic stromal reaction and high expression of stromal fibroblast-associated gene signature.16 ,17 ,42 ,43 Thus, the combination of antistromal agents with classic chemotherapy may provide therapeutic benefits for patients with CRC. Our data show that 1,25(OH)2D3 inhibits the protumoural properties of patient-derived primary colon NFs and CAFs and imposes in CAFs a gene expression programme that is associated with prolonged survival in CRC. Accordingly, high VDR expression in tumour stromal fibroblasts predicts a better clinical outcome in a large cohort of patients with metastatic CRC. Furthermore, the expression of two genes from the 1,25(OH)2D3-associated gene signature, CD82 and S100A4, in the stromal compartment of colorectal tumours from the metastatic CRC patient cohort correlates with VDR expression and clinical outcome. These results widen our knowledge of 1,25(OH)2D3 action and indicate that 1,25(OH)2D3 exerts its antitumoural action on CRC by directly acting on colon carcinoma cells3 ,5 ,9 and through the regulation of the protumoural capacities of stromal fibroblasts. Thus, our data support the possible beneficial effects of therapies using VDR agonists against this disease. This study reveals that 1,25(OH)2D3 has a wide and partially coincident gene regulatory effect on colon NFs and CAFs. The results from our global gene expression analysis suggest that in normal colon 1,25(OH)2D3 may participate in the maintenance of homeostasis as it regulates genes involved in cell adhesion and differentiation, tissue remodelling, wound healing, blood vessel development and inflammatory response. CAFs contribute to tumour progression by modulating extracellular matrix composition and secreting soluble factors that act in a paracrine manner and affect carcinoma cells and other cell types of tumour stroma.11–15 Remarkably, we found that approximately 15% of 1,25(OH)2D3-regulated genes in CAFs are classified as extracellular region components, including growth factors, cytokines and extracellular matrix constituents. In addition, our data indicate that the gene expression programme imposed by 1,25(OH)2D3 in CAFs comprises genes involved in cell migration, angiogenesis, hypoxia and immune response that probably contribute to the newly identified role that stromal fibroblasts play in the antitumoural action of 1,25(OH)2D3 on CRC. Several ongoing clinical trials investigate the preventive and therapeutic role of VDR agonists, alone or in combination with other anticancer agents, against CRC and other neoplasias (http://clinicaltrials.gov/). In 1998, a small study that analysed VDR RNA expression in whole tumour samples from a reduced set of 44 patients with CRC proposed VDR as a marker of favourable prognosis.44 Accordingly, in the current study, we found that high VDR expression in carcinoma cells is associated with longer OS in metastatic CRC. Various reports showed that VDR expression is enhanced in precancerous lesions and early stages of colorectal tumourigenesis (aberrant crypt foci, polyps, adenomas), whereas it decreases in advanced stages.45–49 Accordingly, other studies indicated that the transcription factors SNAIL1 and SNAIL2 repress VDR expression in colon carcinoma cells and confirmed that low VDR expression was found in a proportion of colon tumours associated with poor tumour differentiation.32 ,50 ,51 These data limited the applicability of VDR agonists for CRC to the prevention in high-risk population and treatment in patients at early steps of tumour progression.52 ,53 The present study changes this view and shows that 1,25(OH)2D3 has additional anticancer effects in CRC by acting on tumour stromal fibroblasts and, thus, that the therapeutic action of VDR agonists extends to patients with CRC who express VDR in tumour stromal fibroblasts independently of their VDR expression levels in carcinoma cells (over one-fourth in our cohort of patients with metastatic CRC). Fibroblasts are the most abundant but not the unique cellular component of tumour stroma. Although we observed VDR expression in CRC-associated lymphocytes, no significant association between VDR expression in this cell type and clinical outcome has been found in our cohort of patients with metastatic CRC. The results from our global gene expression analysis indicate that several chemokines and extracellular matrix proteins with immune cell chemoattractant potential are among 1,25(OH)2D3 target genes in CAFs. Thus, 1,25(OH)2D3 may indirectly modulate tumour stromal lymphocyte properties through its action on stromal fibroblasts. In addition, the expression and putative role of VDR in colorectal tumour stromal endothelial cells and immune cell types other than lymphocytes remain unexplored. Finally, our findings reinforce the relevance of tumour stroma and tumour microenvironment as targets for anticancer therapies and strongly support 1,25(OH)2D3 as an important and multifaceted protective agent in CRC. We thank IdiPAZ (RD09/0076/00073) and Fundación Jiménez Díaz (PT13/0010/0012) Biobanks for providing us clinical samples; Drs Luis del Peso and Leandro Sastre (Instituto de Investigaciones Biomédicas “Alberto Sols”) for help with microarray functional enrichment analyses and assistance with the stereomicroscope, respectively; Dr Mercedes Herrera (Hospital Universitario Puerta de Hierro Majadahonda) for help with primary cultures; Drs Estíbaliz Álvarez and Eduardo Gutiérrez (La Paz University Hospital) for assisting with patient recruitment and consent; Dr Tomás Olleros (Grupo Farmasierra) for his continuous support and Robin Rycroft for help with the English manuscript. International Agency For Research on Cancer (IARC). Vitamin D and cancer. IARC Working Group Reports Volume 5. Lyon, France: IARC, 2008.
. Metastatic colorectal cancer: ESMO Clinical Practice Guidelines for diagnosis, treatment and follow-up. Ann Oncol 2014;25(Suppl 3):iii1–9.
. Threshold gradient descent method for censored data regression with applications in pharmacogenomics. Pac Symp Biocomput 2005:272–83.
. Vitamin D receptor expression as a predictive marker of biological behavior in human colorectal cancer. Clin Cancer Res 1998;4:1591–5.
. Vitamin D receptor and cytokeratin expression may be progression indicators in human colon cancer. Anticancer Res 1996;16:2333–7.
. In situ mRNA hybridization analysis and immunolocalization of the vitamin D receptor in normal and carcinomatous human colonic mucosa: relation to epidermal growth factor receptor expression. Virchows Arch 2000;437:501–7. Correction notice This article has been corrected since it published Online First. An Open Access licence has been added. Contributors GF-M and MJL designed and performed most of the experiments. GG-L and DGP performed bioinformatics analyses. AB and AF-B helped with primary cultures. CP took part in the critical discussion and editing of the manuscript. RC provided tissue samples. FR performed immunohistochemical studies and analysed clinical data. GF-M, AM and MJL analysed the data, interpreted results and wrote the manuscript. AM and MJL conceived the hypothesis and supervised the project. Funding This work was supported by grants from Ministerio de Economía y Competitividad of Spain-Fondo Europeo de Desarrollo Regional (SAF2013-43468-R) and Centro para el Desarrollo Tecnológico Industrial (IDI-20130190) to AM; Comunidad de Madrid (S2010/BMD-2344-Colomics2) to AM, CP and FR and Instituto de Salud Carlos III-Fondo Europeo de Desarrollo Regional to AM (RD12/0036/0021), CP (RD12/0036/0041) and FR (RD12/0036/0051, PT13/0010/0012, PI12/01552). Ethics approval This study was approved by the ethics committees for Clinical Research of Hospital Universitario La Paz (HULP-PI-1425) and Fundación Jiménez Díaz (PIC-15/2014). Data sharing statement The microarray gene expression data of our study have been submitted to the GEO database (http://www.ncbi.nlm.nih.gov/gds/) under the accession number GSE70468.